For God’s part, baptism is a sign that he is at work in our lives. He offers to make us a part of his own family - with all the privileges and responsibilities that this brings. For our part, baptism is our active response to that. Especially at such an important time of change in our lives we want to acknowledge our need of God and to involve him. Baptism is a sign to show that we understand this, and that we want to belong to God’s family. The Baptism Service is focussed in three ways: on God, on the parents and godparents, and on the child. Baptism represents our beginning as Christians, the start of our lives as members of God’s own family. 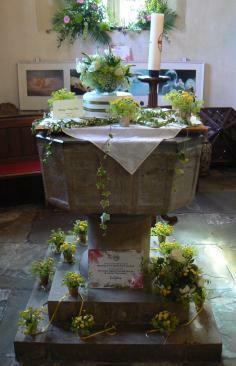 That is why in many churches (like ours) you will find the font near the door. For it is through baptism that we enter the Church. Godparents are those who sponsor a child at their baptism, and they promise to help him or her to grow up in the Christian faith. They have a duty (together with the parents) to ensure that the child is brought up as a member of the Church, and to pray regularly for the child. Clearly if they are to do this, they ought to be Christians. As such we ask that all godparents should themselves have been baptised. Traditionally a child has three godparents, and this is still the norm. However we ask simply that there should be at least two godparents and no more than four. We hope that this helps you to understand about baptism and what it means. If you have any questions, or if you are not clear about anything, do feel free to ask the Team Rector or someone in Church. Getting married is a most important step in life. It is all very exciting - but also perhaps rather overwhelming, with all the arrangements that have to be made. The law requires that, for you to be married in a Parish Church, one of you must have either a clear affiliation or commitment to that church. (iii) be a member of our Church Electoral Roll. The Church Electoral Roll is open to anyone who is baptized, is a regular attender at this Church, and has been so for a minimum of six months. Being divorced is no longer a bar as such to getting marriage in Church. There are, though, still some restrictions in certain cases. The Team Rector will be pleased to talk to you about this, and explain more about it if you wish. Contact the Team Rector. He will answer any questions you may have, and will explain what you need to do. He is also responsible for booking the date and arranging the service. We are here to offer our help and support at this time of loss. It is always emotional and difficult when a loved one dies, even when we are expecting it. Our thoughts and prayers are with you now and in the days ahead. Where to have the Service? Whether you want to come into Church, or go to the Crematorium, one of our team of ministers will always be available to help you prepare and to take the service. How do I plan it? There is no ‘proper’ way to have the service – rather you want to have what is right for you and your loved one. 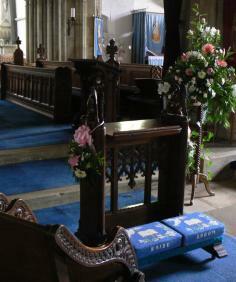 We can advise on prayers and readings and hymns and how the service is conducted. 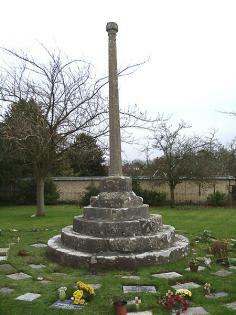 Here at St Laurence we have a plot for the burial of ashes in a beautiful setting round our Memorial Cross. There is also the parish cemetery in Barford Lane. Again we would be happy to talk with you about this and to take the service.